Three years ago I founded Ultra Violence. But as a human you move on, you develop, you are constantly changing and sometimes you then end up with a feeling that other aspects of your life need to change as well. It has already been a while since I was disaffected with the name and design – Ultra Violence refers to the movie “A Clockwork Orange” by Stanley Kubrick and although I still love his work as much as the movie it wasn’t suitable for the blog anymore. Over a few months I was repeatedly thinking of a new name, a new look, a new image. The visual language and also the topics I covered on the blog were already so much different from the beginning so I really couldn’t wait to open up a new book and start from a blank page again. So here you are now: reading a brand new post on my new blog Existhetics. It was really important for me to only have one word, it should be a catchy and easy name and somewhat reflect what I’m doing here. This page is about aesthetics, my own vision of beauty, of style and visual storytelling, but as I also address many existential topics in the philosophical sense of the word (referring to Albert Camus, Satre and so on), to simply name the blog “Aesthetics” wouldn’t have been enough. The two main topics of the blog combined form my neologistic name – Existhetics. This blog page started as a mainly fashion blog but I also want to write about other topics which are close to my heart. The look I’m showing you in the images is dominated by my favorite non-color black. 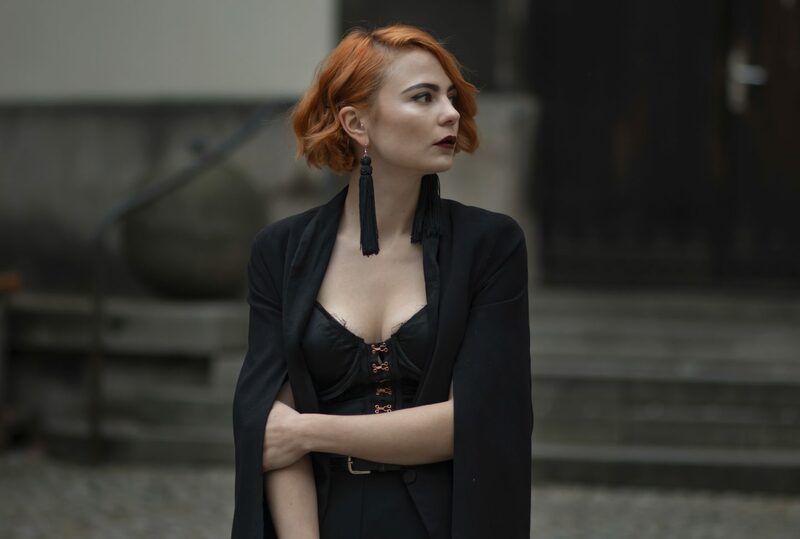 I wear a black suit, consisting of a wonderful cape blazer and high-waisted trousers both by H&M and underneath a silk body which I found on For Love & Lemons. To keep it as festive as possible I put on long black tassel earrings which I’ve found on Zalando. To enhance the golden hooks of the body I combined the suit with my Dior Saddle bag and the golden Gucci Marmont pumps. I hope you enjoyed reading the very first blog post here on Existhetics and are at least half as excited for all the upcoming content as I am! Wow – der Look ist der Hammer Girl! All Black ist immer eine gute Idee! erstmal Herzlichen Glückwunsch zum neuen “Start” von Existhetics . Die Message dahinter finde ich klasse , der Name passt perfekt. Ich bin super gespannt, auf neue Themen und natürlich weiterhin auf perfekte Bilder und Fashion. Dein Blog hebt sich auf jeden Fall von der Masse ab und ich liebe die Bildsprache. Erstmal viel Erfolg im neuen Jahr Liebes !!! Existhetics hört sich mega gut an und passt perfekt zu dir und deinen Bilder, Looks und deinem Lifestyle. Generell machst du einen super Job und bist sehr inspirierend. Mach auf jeden Fall weiter so. Egal mit welchem Namen. Du rockst es! Wow, erstmal: du siehst ganz wundervoll aus auf deinen Bildern – wirklich großartig! Ich verstehe, dass man manchmal den Bedarf nach einem neuen Start hat und bin wahnsinnig gespannt, was alles kommen wird. Der Anfang ist schon sehr vielversprechend!